A memorial to the former BBC wartime radio and television broadcaster Wynford Vaughan-Thomas has been restored following an appeal. 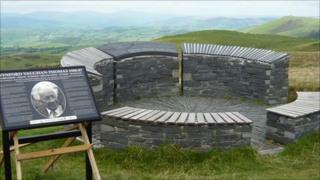 The Welsh slate viewing platform was opened in 1990, but it fell into disrepair and was vandalised. The memorial near Machynlleth, Powys, highlights 13 of Wales' highest peaks and was reopened by Montgomeryshire MP Glyn Davies on Friday. Money was raised by the Campaign for the Protection of Rural Wales (CPRW). Vaughan-Thomas served as CPRW president and chairman between 1968 and 1975. After his death in 1987, the organisation decided to build a memorial in Welsh slate at one of his favourite locations near the village of Aberhosan, on the slopes of Moel Fadian. It spans some three metres (9ft 8in) and depicts the broadcaster pointing to Snowdon. It highlights all 13 peaks in Wales above 3,000ft (914m). But the years had taken their toll on the memorial. Graffiti was scratched onto the slate, a wooden seating area was rotting, some slate panels had been lost or stolen, and it was eroding elsewhere. The CPRW managed to raise £11,000 to help repair the memorial. Director Peter Ogden said: "We are extremely grateful to all those individuals and organisations who have so generously contributed to the restoration of this wonderful landmark as it is a special and fitting tribute to one of Wales' greatest environmental champions and a person who truly appreciated the importance and magnificence of our Welsh landscapes." Montgomeryshire MP Mr Davies said it was a "great privilege" to be associated with the memory of Wynford Vaughan-Thomas. He added: "This site, above Llyn Clywedog, offers some of the most dramatic views over the Welsh mountains landscape that Wynford loved and wrote about so poetically. He was a very special Welshman, and there is no more appropriate place to remember him." Another Glyn Davies will also attend Friday's ceremony. Mr Davies, 89, accompanied Vaughan-Thomas when he travelled the front lines in Anzio, Italy, during World War II. Meanwhile, a new information panel about Vaughan-Thomas has been placed at the viewing platform and a podcast detailing the broadcaster's life can be downloaded from the CPRW's website. Vaughan-Thomas was born in Swansea in 1908. In the mid-1930s he joined the BBC, but it was during World War II that he established a reputation as one of the corporation's most respected correspondents. Perhaps his most memorable report came from an RAF Lancaster bomber during a raid over Berlin. In 1967, after leaving the BBC, he was one of the founders of Harlech TV (HTV), now ITV Wales, and was its director of programmes. He died in Fishguard, Pembrokeshire in 1987.